Throughout the 13th season of Project Runway, contestant Korina Emmerich teetered between snotty and arrogant. What’d you expect when you let Kenya bring a bullhorn to the RHOA reunion? Haha haha, HAHAHA I loved how Porsha dragged (drugged?) 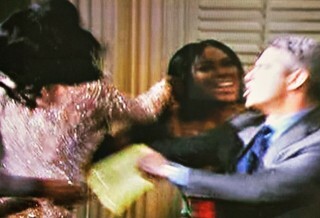 Kenya across the floor in tonight’s Real Housewives of Atlanta reunion. Yes, I did love it.